Vâlcea, the area with the most complete geography in the country, displays all landforms - mountains, hills, plateaus, meadows, plus the gullets of the Olt and the Lotru - was first certified by a document issued by the ruler Mircea cel Bătrân, on 8 January 1832. Apart from the richness with which it was endowed by nature, Vâlcea county boasts with a matching spiritual and historical affluence, embodied by the numerous monastic establishments (monasteries, sketes and churches) – with over 280 churches already on the list of historical monuments. Of the total number of churches, 114 are wooden and 88 of these are on the UNESCO heritage list. The church with the titular saint “Parascheva of the Balkans”, of Vaideeni, is the oldest wooden church (1556-1557), enacted on the ruins of an ancient Dacian citadel. 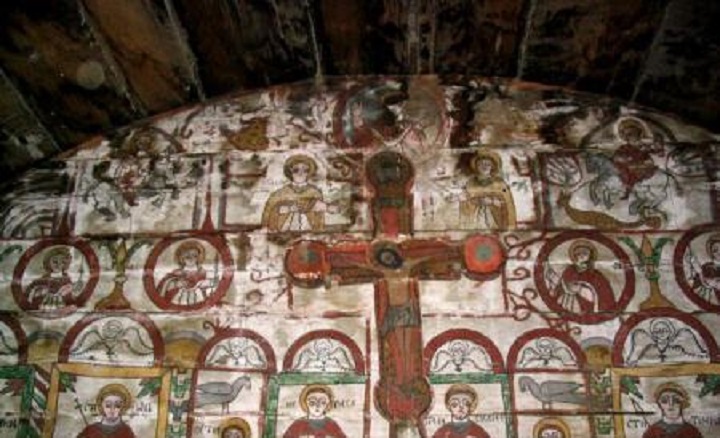 A small and plain church, with an archaic look and a naïve brushwork filled with symbols. In Vaideeni, we find two more monument churches, made of bulwark: the church with the titular saint “St. John the Baptist” (1878), in the village of Cornet and the church with the titular saint “Holy Mary”, in the village of Izvorul Rece. The “Dintr-un Lemn Monastery”, of Frâncești, makes its first appearance in official documents in April 1635 and is recorded by Paul of Aleppo, who also tells the legend of the emergence of the holy establishment: they say that a monk found, within the cavity of a secular oak tree, an icon of Holy Mary; at the same time, it is said that he heard a voice telling him to build a church from the trunk of that particular tree, which he did. The icon is still present today in the monastery’s stone church. The “Cozia Monastery”, one of the jewels of the authentic Romanian architecture, a witness to the numerous historical scenes along its 600 years of existence (enacted between 1387-1391), shall stand through its artistic and spiritual significance. The journey through the Vâlcea monasteries truly deserves the attention of the history- and spirituality-loving tourists and of those who are in love with trailing through the charming scenes of nature.